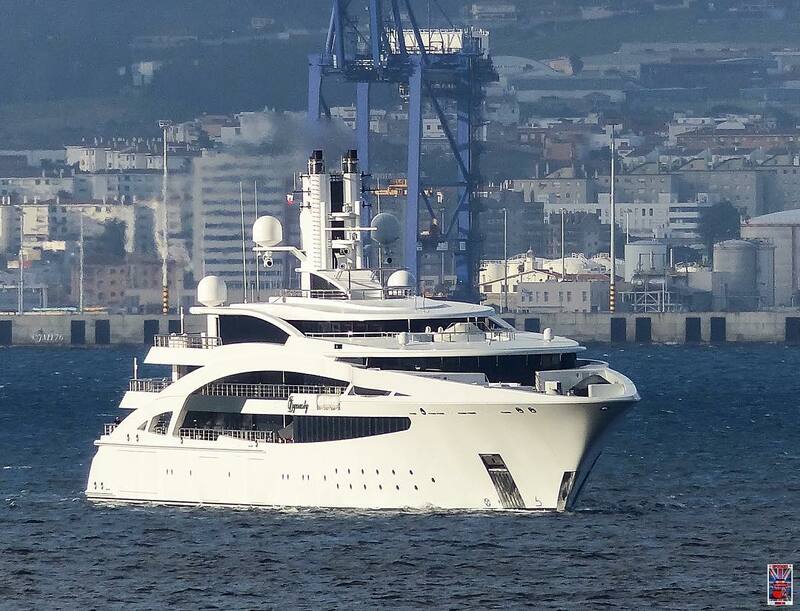 Built by Kusch Yachts at its Wewelsfleth shipyard and delivered in 2015, M/Y I Dynasty is a 101m/331′ superyacht created for Alijan Ibragimov as a successor to his 59m Benetti, also named I Dynasty. I Dynasty is the second largest superyacht ever built by Kusch and was a finalist in the 2016 world superyacht awards 2999 and above gross ton category. I Dynasty’s exterior was designed by The A Group and the interior by Studio Massari. The interior plan includes accommodations for up to 22 guests in 11 cabins and an additional 15 cabins for more than 30 crew members. Not much is known about the details of the interior accommodations but it is known to include luxury amenities such as a tender garage, swimming pool, jacuzzi, spa and elevator among others. With a displacement steel hull, aluminum superstructure and 4300 ton displacement I Dynasty is capable of a top speed of 17 knots and cruising speed of 14 knots powered by five Rolls-Royce engines. The yacht also has an 18′ draft and 52′ beam.